We’ve all heard this saying before… but what would you say if I told you, “What you eat affects how you feel”? 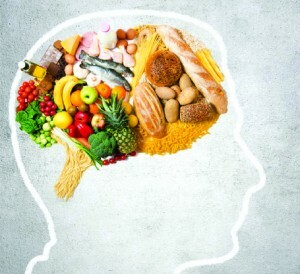 The fuel we give our body is the same fuel we give our brains. So it’s not a surprise that if you eat overly processed foods or too many sugars, you have an increased tendency towards anxiety, depression, attention/focus problems and many more. A child’s brain, for instance, cannot focus on school work or testing if it’s overcome with processing and breaking down food loaded with chemicals. How do I know if what I eat is affecting my mood? I’m not overweight or obese, so I guess that means I’m mentally healthy, and this anxiety can be behaviorally controlled? Incorrect. How much you weigh DOES NOT indicate how HEALTHY you are and most certainly does not indicate how mentally healthy you are. What is being overlooked is the connection between what we eat, how well we process it in our body and what that means to our brain and mental health. FAST FOOD MAKES ME CRANKY! How often do you go to the Psychiatrist or Psychologist with anxiety or depression and they ask you what you are eating? Do they test your nutrition through bloodwork or DNA analysis (Hair Analysis)? Do you have toxic metals in your system contributing to anxiety, depression, or hyperactivity? Do you have slow metabolism causing insomnia? Or do you have inflammation causing depression? Unfortunately, more often than not, our nutritional states are not being evaluated by our physicians or therapists. What if I eat a fairly healthy diet but still have issues with anxiety or depression? Malabsorption, slow metabolism, toxic metals, yeast, auto-immune disease, and inflammation are just a few of the conditions we see that exacerbate or cause mental health difficulties. And these can occur from eating healthy foods such as broccoli or kale. Everyone’s body is working at a unique level and what may be beneficial or healthy for one person, can cause stomach upset and anxiety for another. At The Brain and Wellness Center, we offer services in conjunction with Dr. Serena Bordes, ND, DOM ,Lac, that measure the mineral content in your hair. With this information, a world of metabolic events can be interpreted. Not only can your nutritional status be viewed but we can also learn much about how efficiently your body is working. We can detect toxic metals, mineral and element imbalances, metabolism rates and absorption issues, as well as profiles including but not limited to hypoglycemia and candidiasis. Don’t forget your Brain Training. Neurofeedback works to regulate your Central Nervous System and the Autonomic Nervous System. These systems control information to hormone centers of the brain like the pituitary gland, as well as balancing the brain and “un-sticking” the “fight or flight” response that controls our CNS and ANS. This not only affects our metabolism and endocrine functioning but also causing emotional problems such as panic attacks and anxiety. Neurofeedback teaches the brain to balance neurons and to self-regulate or become “more flexible” in adjusting to stressful situations. Through this self-regulation, symptoms of anxiety, depression, ADHD, ect. will reduce or be eliminated.